Editor's note: today we have Steven van Vessum from ContentKing to share his own method to continually review, analyze, and identify opportunities to improve your content and where the competition is outperforming you. We also hosted Steven on a fantastic webinar about the continuous SEO process. Take it away, Steven. Most of us have been there… You’re working hard to grow your business through content marketing, but at some point you just get stuck. Your growth flatlines and you lose all inspiration. 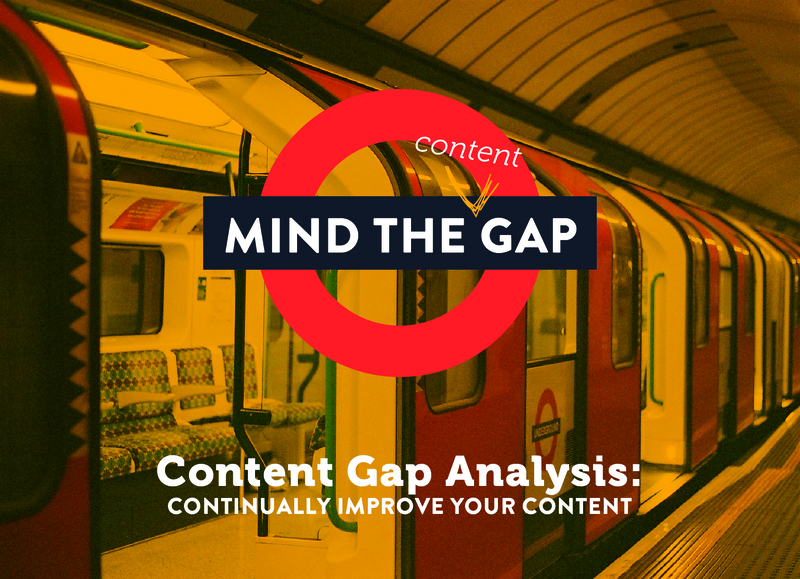 A Content Gap Analysis will get the ball rolling again! In this article I will explain how you can perform a Content Gap Analysis (CGA) to analyze the performance of your current content, where it can be improved, and what content you’re missing in comparison to the competition. I recommend performing a CGA every quarter. This keeps you on your toes and drives you to constantly improve and expand, in line with the Continuous SEO philosophy. Goal(s) you want to achieve. Keywords you want to incorporate. Organic traffic and conversions (based on the last 12 months). Social traffic and conversions (based on the last 12 months). Your web analytics suite should be able to give you those traffic and conversion numbers. Use a scale from 1 to 5 to define the degree to which you’re happy about your organic traffic, social traffic, and usability. 1 means “very bad” and 5 means “very good”. In Step 1 you mapped out how your content is doing. Now let’s look at how its current performance measures up to the desired performance -- or in other words, the gap in your content's performance. In order to do this, you first need to define what your desired performance is. Only then can we make the Content Gap visible and take the necessary steps to bridge that gap. For each page, fill in the desired performance for organic traffic, social traffic and usability in the CGA spreadsheet. Again, use a scale from 1 to 5, just like you did in Step 1. Using a simple formula, the ‘Gap’ columns actively compare current performance and desired performance. Green: when current performance and desired performance are the same. This is good! Keep it up! 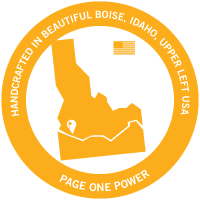 Orange: when current performance is slightly less than desired performance. This could do with some looking into. Red: when current performance is significantly worse than desired performance. These pages will require a lot of work! By now you should have a strong idea of which content needs your focus. Use the CGA spreadsheet to define follow-up tasks to improve your content. Have a close look at Step 2 of our Content Optimization article for guidelines and inspiration. Though the Content Optimization article didn’t mention them, external factors can also play a big role in the success of your content from SEO and Social standpoints. For SEO, these are links from external websites (“backlinks”). For Social, these are shares by others. For both of these situations, it’s important to realize that success is about relationships between people. You can proactively reach out to people and make them aware of your content, asking if they want to link to it or share it on social media. The sum of the points from the ‘Gap’ columns is shown in the ‘Priority’ column. The higher the score, the higher the priority this page has. Step 1 and 2 are all about your content. In Step 3, we’ll analyze your competitor’s content, and how it stacks up against yours. What content topics do you and your competitors have in common, and where do they outperform you? What effective content do they have that you don’t? Two prominent arenas to assess this difference are SEO and social media. Let's look at how a CGA can help you analyze your content in each of these instances, and then review the tools you can use to perform a CGA. 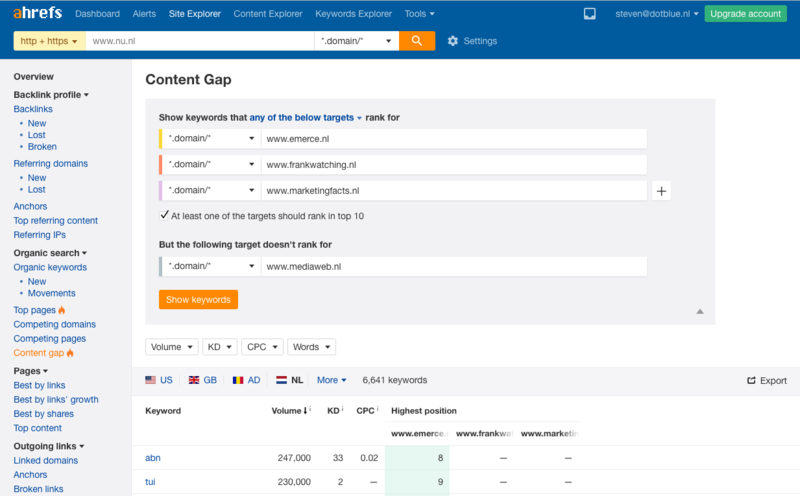 To analyze your content from an SEO perspective, you want to understand which keywords your content is targeting, where those pages rank for the intended keywords, and how much organic traffic the pages receive. Let’s say you and your competitors both have a page on their website about payroll services for fitness clubs. Your competitors all rank on page 1 for relevant keywords such as [fitness club payroll], but you’re on page 4. Around 90% of Google users don’t go beyond page 1, so you’re losing out traffic on page 4. Another possible issue is keyword targeting. Do your competitors target keywords and businesses you don't, but should? If we take the example of payroll services again, maybe they’ve also created pages to target payroll services for hairdressers, bakeries, theme parks, dentists, etc. If you don’t have that content, then you’re never going to rank for keywords related to those types of business. Even though it’s possible, I don’t recommend doing this competitor analysis manually. Manual competitor analysis is very tedious and your findings will not be very accurate. Use specialised tools such as SEMrush and Ahrefs. Both track and report the keywords websites are ranking well for, and the corresponding ranking page. That comes in handy when you’re doing keyword research, as well as a CGA! SEMrush offers a free 7-day trial and Ahrefs offers a 14-day trial. That gives you more than enough time to perform your CGA at no initial cost. Choose one of the tools and create a free trial account. Choose ‘Domain vs. Domain’ under ‘Domain Analytics’. Use the flags to select the right country. Fill in your first competitor’s domain name, and then enter your own domain name. Select ‘Unique to the first domain's keywords’ as the analysis method and press the green ‘Go’ button. Click ‘Export’ on the right-hand side, just above the keyword table. Repeat the steps above for your most important competitors. Choose ‘Content gap’ under ‘Organic search’. Fill in your most important competitors under ‘Show keywords that any of the below targets rank for’ and keep the checkbox ‘At least one of the targets should rank in top 10’. Fill in your own domain name under ‘But the following target doesn't rank for’ and press the orange ‘Show keywords’ button. 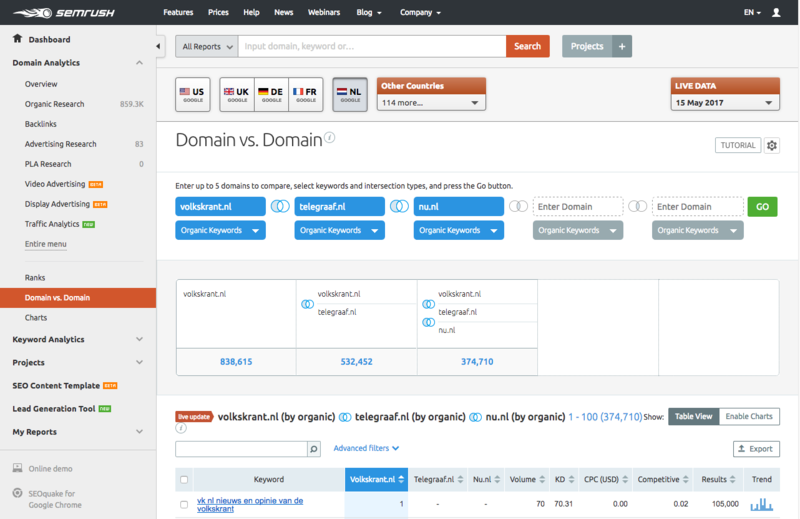 Go through the exports and determine which keywords interest you most. Not every keyword your competitor is ranking for matters to your business. There will be some services your competitors offer that you don’t. And when you take into account monthly search volume, ranking-related issues, business value, and the pages ranking in the search engine results, there’s really no avoiding it — trying to rank for every keyword out there just isn’t a wise move. This is where prioritization can help you! Make a list of interesting keywords, and add them to your Content Strategy if you already have one. If you don’t, this is the ideal time to get started on one! To better understand how a CGA can help you perform better in social media, let’s continue with the payroll services example. Some of your competitors are generating a lot of leads through their website, but you’re not sure how. You enter their domain into BuzzSumo and find they’ve developed a tool which makes a quick and easy Gross Net wage calculation. 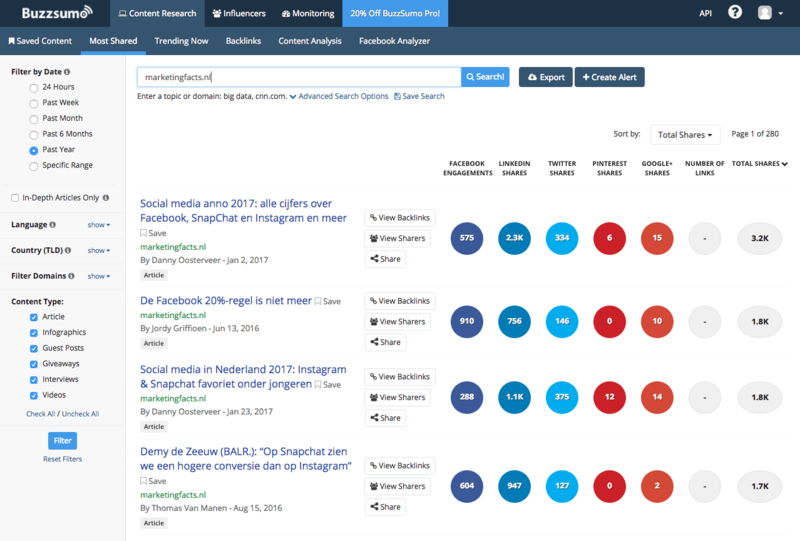 BuzzSumo lets you analyse what content from your competitors is successful on social media. The problem is that since you don’t have access to their web analytics data, you need to rely solely on the amount of shares and engagement of their content on social media. Luckily, BuzzSumo offers these insights, as well as a 14-day free trial. Create a free account and start analyzing your competitor’s content success in social media. Unfortunately it’s not possible to perform an automated CGA for social media, so make sure you have a good overview of the content topics you’ve covered yourself. It will make the analysis a lot more effective as you scroll through the BuzzSumo data on your competitor. Log on to BuzzSumo. You’ll land on the ‘Most Shared’ screen, part of ‘Content Research’. Fill in your competitor’s domain and press the blue ‘Search!’ button. BuzzSumo will return the most successful content based on social media share count. Press the ‘Export’ button to the right of the blue ‘Search’ button to export this overview. Repeat this process for your most important competitors. Go through the exports and determine which content topics are relevant for you. Similar to the CGA for SEO, not all of their successful content is related to your business. Mark topics that performed well on social media and are relevant to your business, and add them to your content strategy. Never stop scrutinizing the performance of your own content. Without critical review, you'll never identify where you need to change. And without change, you'll never achieve progress. I highly recommend you periodically analyze your content with a Content Gap Analysis to identify content you need to promote more, and to identify the content topics your competitors are using to drive traffic to their site. And remember: your content is never finished. Steven has been in the SEO industry for over a decade. He's worked with large and small companies from all over the globe, in a variety of niches. After being an in-house SEO for three years he was approached by Google to join their Search Quality team. Instead, he chose to start his own agency which he ran for 8 years. 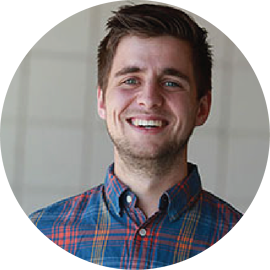 All of this knowledge and expertise culminated when he co-founded real-time SEO auditing and chance tracking application ContentKing.